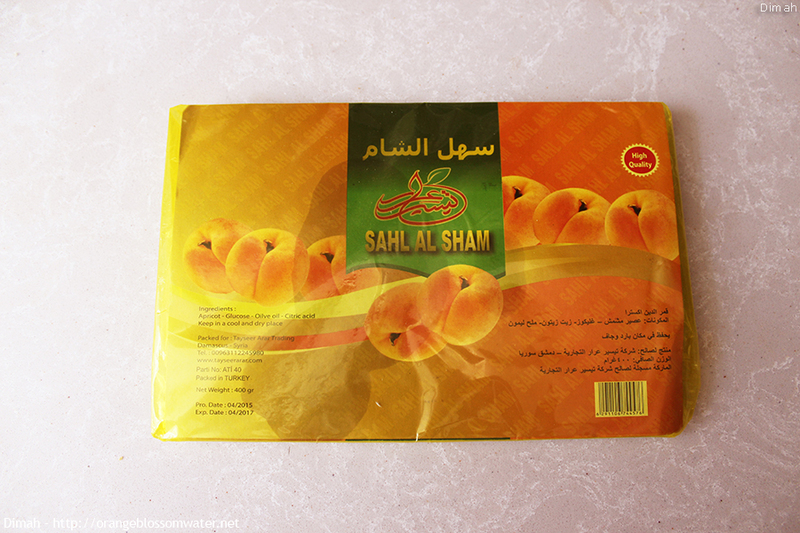 Qamar Ad-Din is dried apricot paste, the origin of Qamar Ad-Din is Syria. 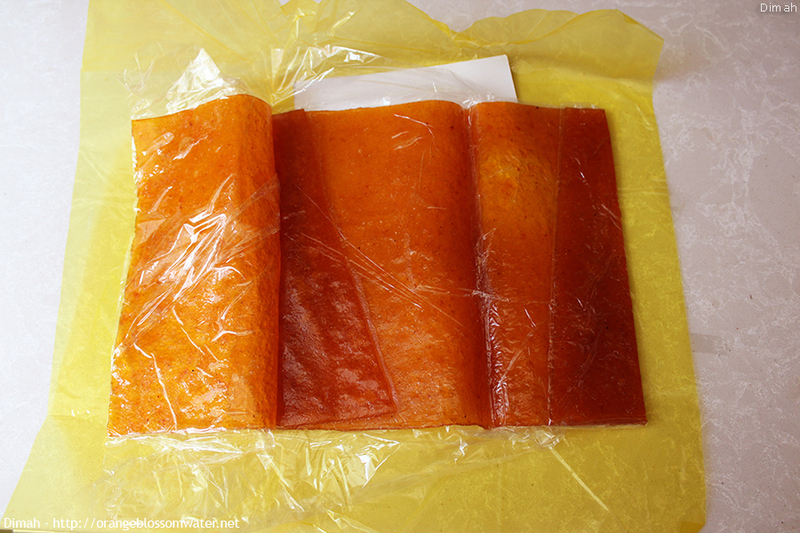 Qamar Ad-Din is used with various recipes such as Sharab Qamar Ad-Din, Fattet Qamar Ad-Din, Mhlabiyeh (Qamar Ad-din Pudding) and Nqou’eiyeh (Qamar Ad-Din cooked with rice). 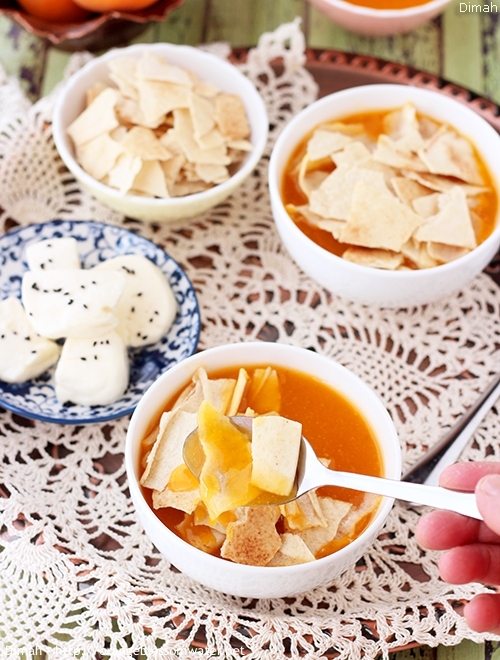 Fattet Qamar Ad-Din is Sharab Qamar Ad-Din eaten with crispy flat bread, a specialty of Hama and Aleppo. In Aleppo, it is named Mariset Qamar Ad-Din. 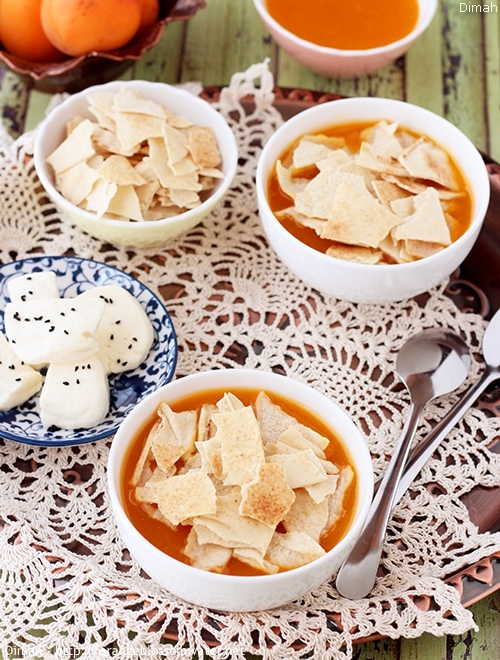 It is an easy recipe, a simple dish, yet delicious. 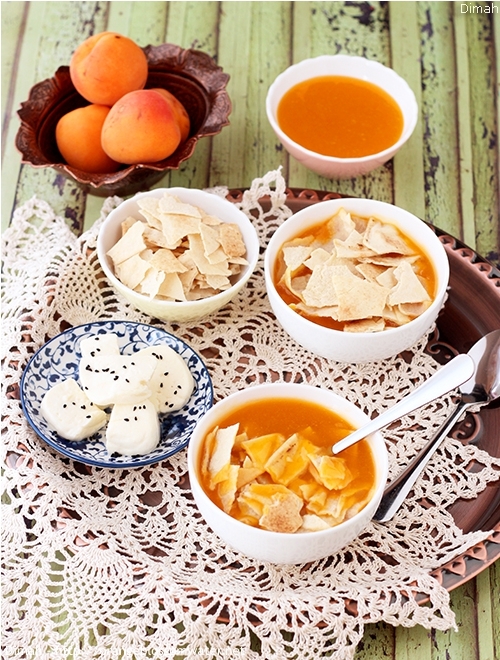 Eaten in summer as breakfast, lunch or snack. 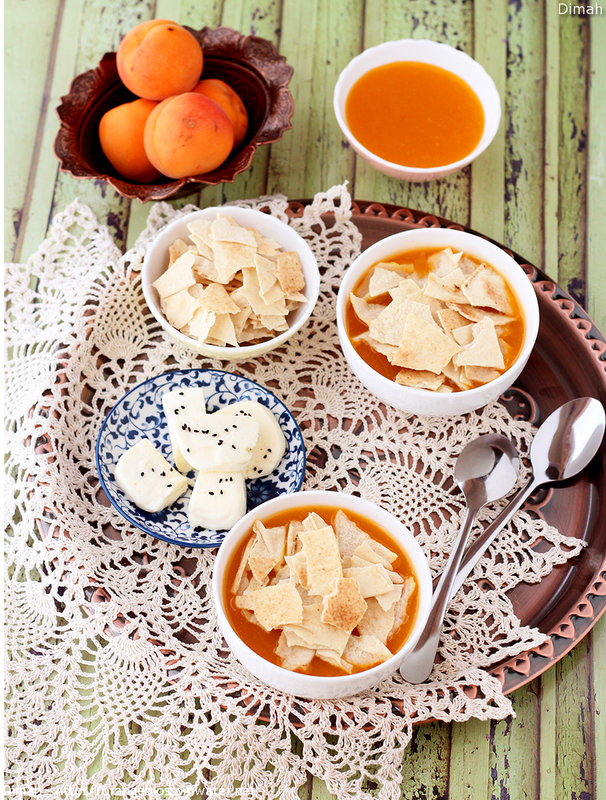 Fattet Qamar Ad-Din is eaten with crispy flat bread pieces. 1. Prepare a baking sheet. 2. Put a loaf of Arabic flat bread on it. Keep it uncovered at room temperature until crispy, it took 24 hours. 11. After 24 hours, torn the loaf into pieces. 12. Put in a bowl and set aside. 13. Prepare a baking tray. 14 to 21. 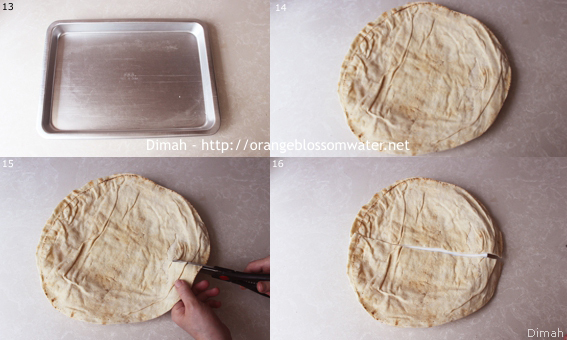 Use scissors and cut Arabic flat bread into squares then lay the squares on the tray. Keep it uncovered at room temperature until crispy, it took 24 hours. 22, 23.Put in a bowl and set aside. 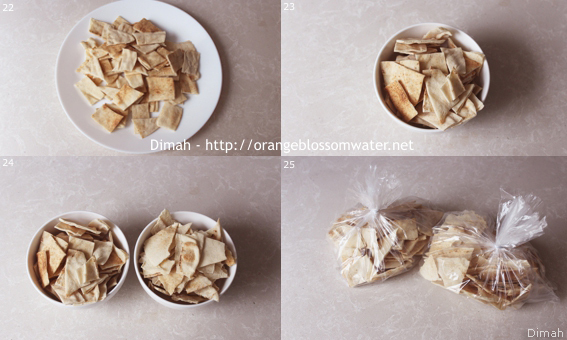 24.The traditional shape of bread pieces is the first one (picture 11 – 12). 25. When not in use, store bread pieces in a bag in the refrigerator. Can be used for any recipe. 30, 31, 32, 33. Cut the sheet into pieces. 34, 35. Put 3 tablespoons sugar in a jug. 35, 37. Add 350 ml water to sugar, and stir to dissolve. 38, 39, 40, 41. 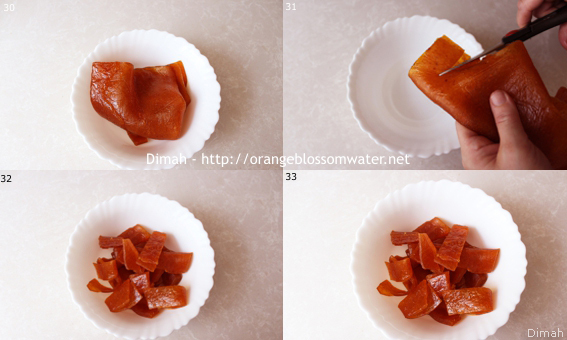 Add dried apricot pieces to the mixture of water and sugar, and keep it in the refrigerator for 24 hours to soak. 42, 43, 44, 45. 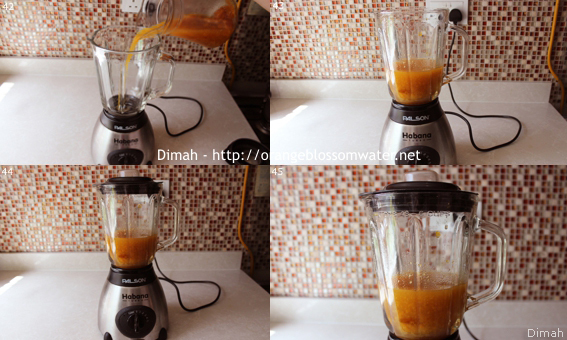 After 24 hours, pour the mixture into the blender, and run the blender few times. 46, 47, 48, 49. 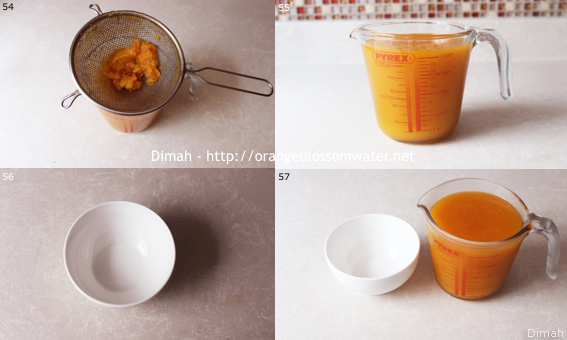 Add 100 ml water and 50 g ice cubes to the drink, and run the blender few times until all dried apricot pieces dissolve. 50, 51. Place a stainless steel mesh strainer over your bowl and pour the drink through the strainer. 52 53. 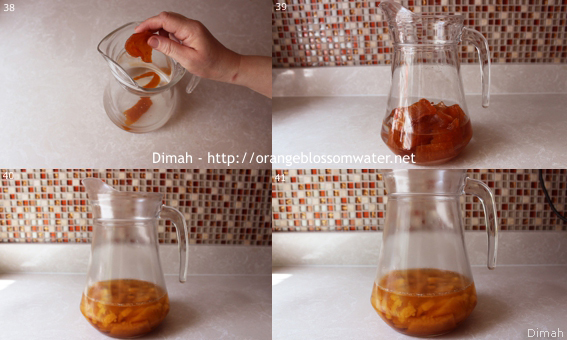 Use a spoon and press against the strainer to extract as much pure drink as possible. 55, 56, 57, 58, 59. Pour the drink into serving bowl. 60, 61, 62, 63, 64, 65. 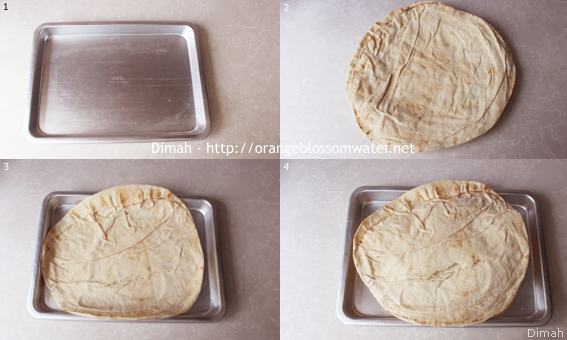 Top with dried Arabic flat bread pieces. 66, 67, 68, 69. 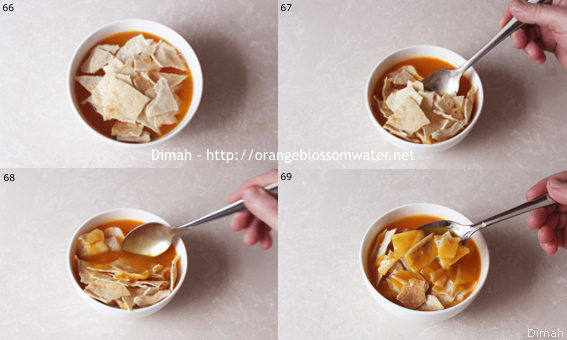 When eating, mix the bread pieces with Qamar Ad-Din drink to soak them and eat. 70. Serve Fattet Qamar Ad-Din chilled accompanied by jebneh. Put a loaf of Arabic flat bread on it. Keep it uncovered at room temperature until crispy, it took 24 hours. After 24 hours, torn the loaf into pieces. Put in a bowl and set aside. 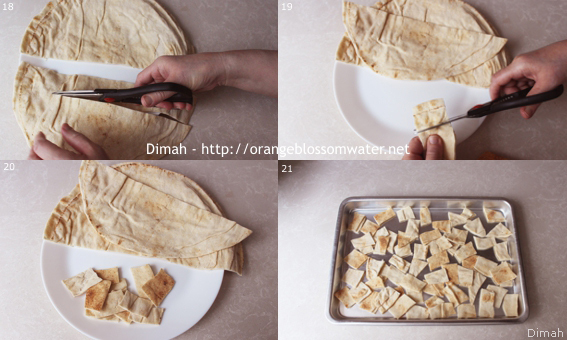 Use scissors and cut Arabic flat bread into squares then lay the squares on the tray. Keep it uncovered at room temperature for until crispy, it took 24 hours. After 24 hours, put in a bowl and set aside. 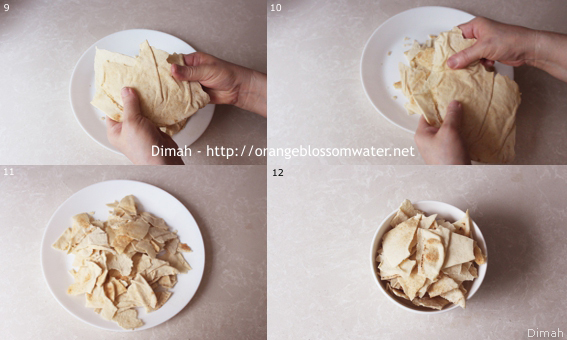 The traditional shape of bread pieces is the first one (picture 11 – 12). When not in use, store bread pieces in a bag in the refrigerator. Can be used for any recipe. Cut the sheet into pieces. Put 3 tablespoons sugar in a jug. Add 350 ml water to sugar, and stir to dissolve. 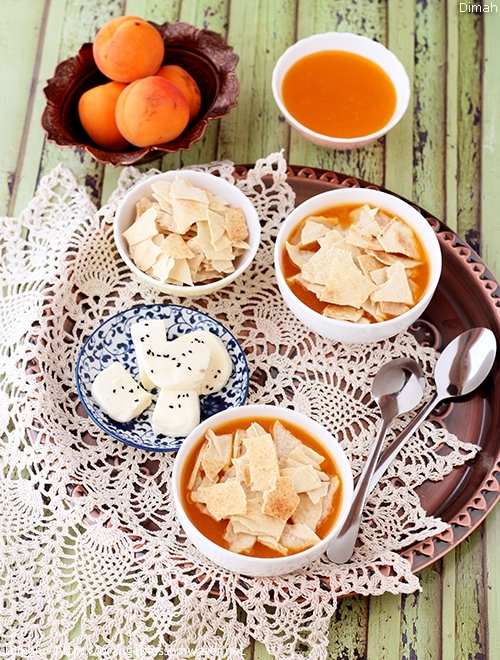 Add dried apricot pieces to the mixture of water and sugar, and keep it in the refrigerator for 24 hours to soak. 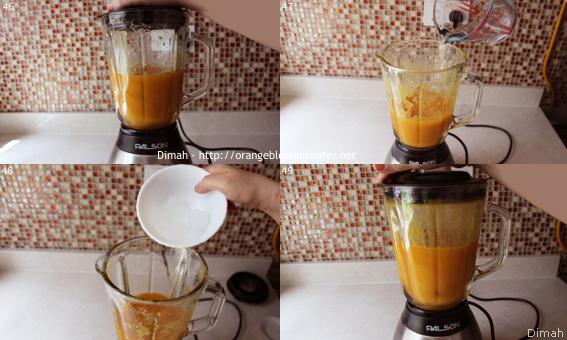 After 24 hours, pour the mixture into the blender, and run the blender few times. 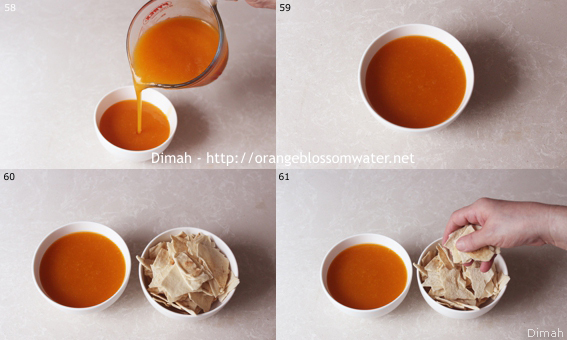 Add 100 ml water and 50 g ice cubes to the drink, and run the blender few times until all dried apricot pieces dissolve. 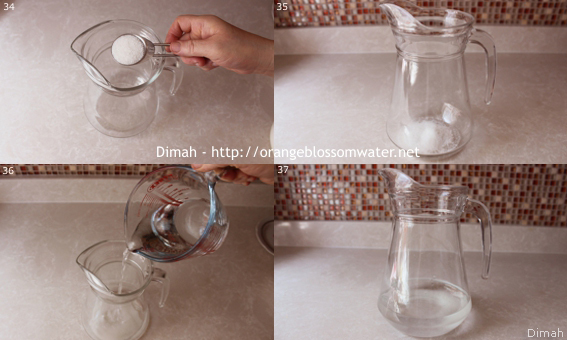 Place a stainless steel mesh strainer over your bowl and pour the drink through the strainer. 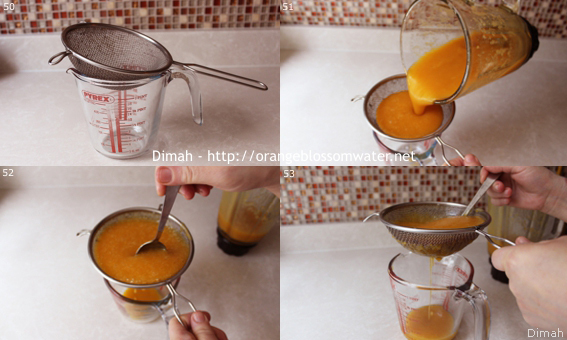 Use a spoon and press against the strainer to extract as much pure drink as possible. Pour the drink into serving bowl. Top with crispy Arabic flat bread pieces. 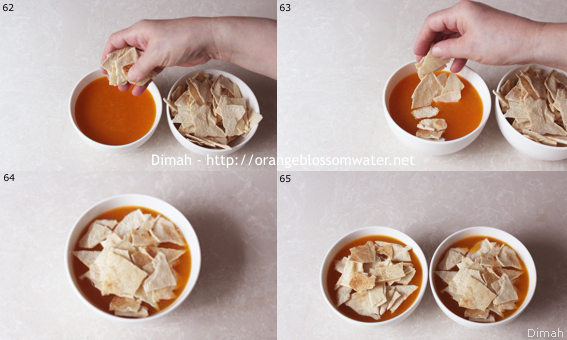 When eating, mix the bread pieces with Qamar Ad-Din drink to soak them and eat. Serve Fattet Qamar Ad-Din chilled accompanied by jebneh. 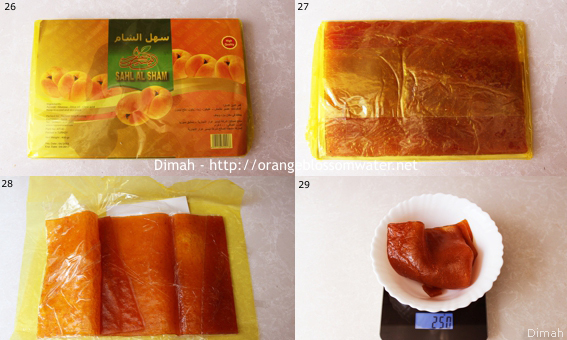 Click here and here for larger photos for the sheet of dried apricot paste. 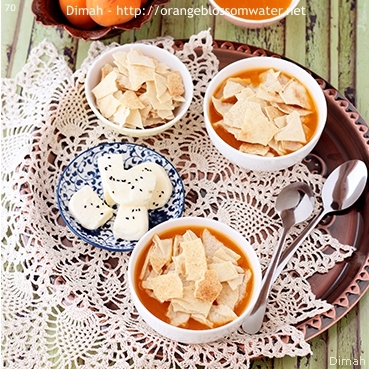 In Aleppo, orange blossom water is added to the dish. 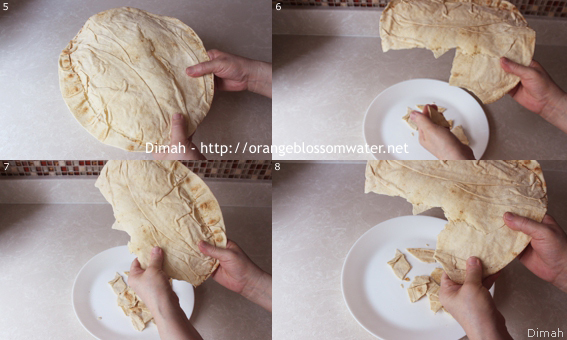 This entry was posted on Tuesday, July 31st, 2018 at 4:15 PM	and is filed under Syrian Breakfast, Syrian Cooking. You can follow any responses to this entry through the RSS 2.0 feed. You can skip to the end and leave a response. Pinging is currently not allowed.